The Buddha's first sermon after his enlightenment is preserved in the Pali Sutta-Pitaka (Samyutta Nikaya 56.11) as the Dhammacakkappavattana Sutta, which means "The Setting in Motion of the Wheel of Dharma." In Sanskrit, the title is Dharmacakra Pravartana Sutra. In this sermon, the Buddha gave the first presentation of the Four Noble Truths, which are the foundational teaching, or primary conceptual framework, of Buddhism. Everything he taught after that ties back to the Four Truths. Before his realization, the future Buddha, Siddhartha Gautama, had been traveling with five companions, all ascetics. Together they had sought enlightenment through extreme deprivation and self-mortification -- fasting, sleeping on stones, living outdoors with little clothing -- in the belief that making themselves suffer would cause a spiritual breakthrough. Siddhartha Gautama eventually realized that enlightenment would be found through mental cultivation, not through punishing his body, When he gave up ascetic practices to prepare himself for meditation, his five companions left him in disgust. 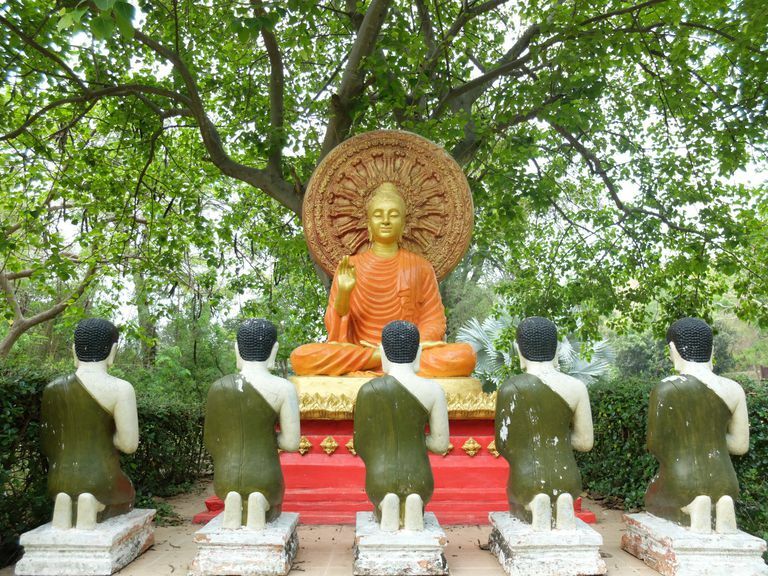 After his awakening, the Buddha remained at Bodh Gaya for a time and considered what to do next. What he had realized was so far outside ordinary human experience or understanding that he wondered how he could explain it. According to one legend, the Buddha did describe his realization to a wandering holy man, but the man laughed at him and walked away. Yet as great as the challenge was, the Buddha was too compassionate to keep what he had realized to himself. He decided that there was a way he could teach people to realize for themselves what he had realized. And he decided to seek out his five companions and offer to teach them. He found them at a deer park in Isipatana, which is now called Sarnath, near Benares, This was said to be on a full moon day of the eighth lunar month, which usually falls in July. This sets the scene for one of the most auspicious events in Buddhist history, the first turning of the dharma wheel. The Buddha began with the doctrine of the Middle Way, which is simply that the path to enlightenment lies between extremes of self-indulgence and self-denial. This simple explanation doesn't do the Four Truths justice, so I hope if you are unfamiliar with them you will click on the links and read further. It's important to understand that merely believing in something, or attempting to use willpower to not "crave" things, is not Buddhism. After this sermon, the Buddha would continue to teach for about forty more years, and almost all of his teachings touched on some aspect of the Fourth Noble Truth, which is the Eightfold Path. Buddhism is the practice of the Path. Within the first three Truths can be found the doctrinal support for the Path, but the practice of the Path is essential. Two more important doctrines were introduced in this sermon. One is impermanence. All phenomena are impermanent, the Buddha said. Put another way, everything that begins also ends. This is a big reason life is unsatisfactory. But it's also the case that, because everything is always changing liberation is possible. The other important doctrine touched on in this first sermon is dependent origination. This doctrine would be explained in detail in later sermons. Very simply, this doctrine teaches that phenomena, either things or beings, exist inter-independently with other phenomena. All phenomena are caused to exist by conditions created by other phenomena. Things pass out of existence for the same reason. Throughout this sermon, the Buddha placed great emphasis on direct insight. He didn't want his listeners to simply believe what he said. Rather, he taught that if they followed the Path, they would realize the truth for themselves. There are several translations of the Dhammacakkappavattana Sutta that are easy to find online. Thanissaro Bhikkhu's translations are always reliable, but others are good, too.